A diverse range of co-working spaces are springing up across the UK, and this demand reflects the changing culture of work. […] The words of Seth Godin, ‘When you need to have a meeting, have a meeting. When you need to collaborate, collaborate. The rest of the time, do the work, wherever you like.’ In the modern world, you can be free to choose where and how you work. […] Here at Ministry of Time, we fervently believe that co-working is a trend that is here to stay. 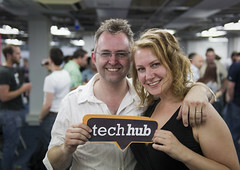 That’s why we are so excited to be working with the Tech Hub. Based in Shoreditch, Tech Hub is a new and exciting project creating a physical space in London for tech companies not just based nearby but entrepreneurs and others in the tech industry from across the UK, Europe, the US and beyond.